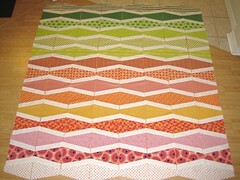 I'm making progress on my New Wave quilt in between working on swap packages. I really like how this is turning out! I hope it will be big enough! I added two more rows and three columns to the original pattern, but I'm still a bit nervous. My cousin wanted a longer blanket since he is really tall and he wanted it to be able to cover both him and his future wife when they sit on the couch. After I get the top together I'll measure and see if I need to add a border or something.